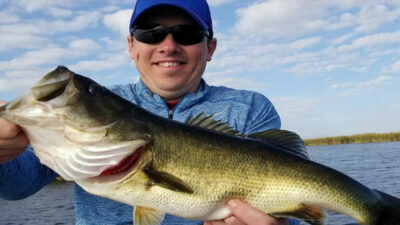 Lake Okeechobee Bass Fishing is one of the best ways to spend time in the outdoors. While visiting and traveling to Florida, make sure to keep fishing in mind. Lake Okeechobee is a fantastic lake to fish this time of year. 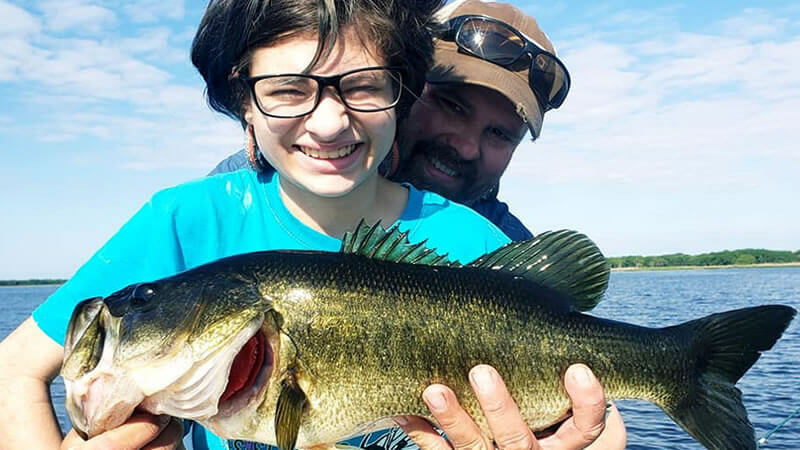 You can catch big bass and create memories of a lifetime with your family. 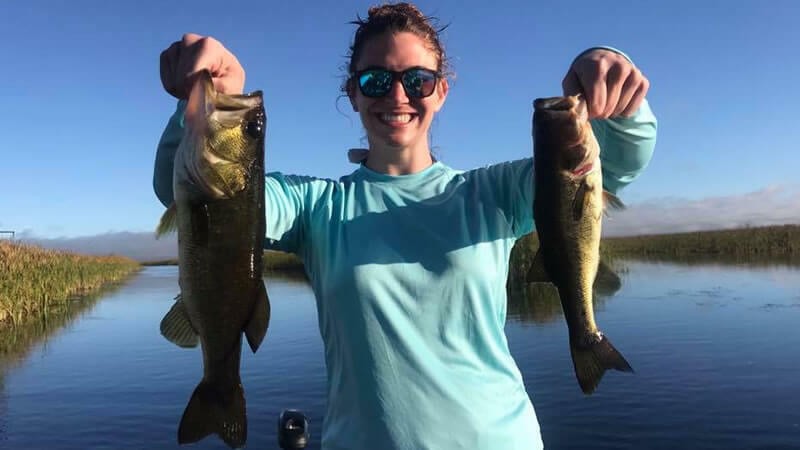 Experience our family Okeechobee fishing charters for memories of a lifetime with our local experts and professionals. 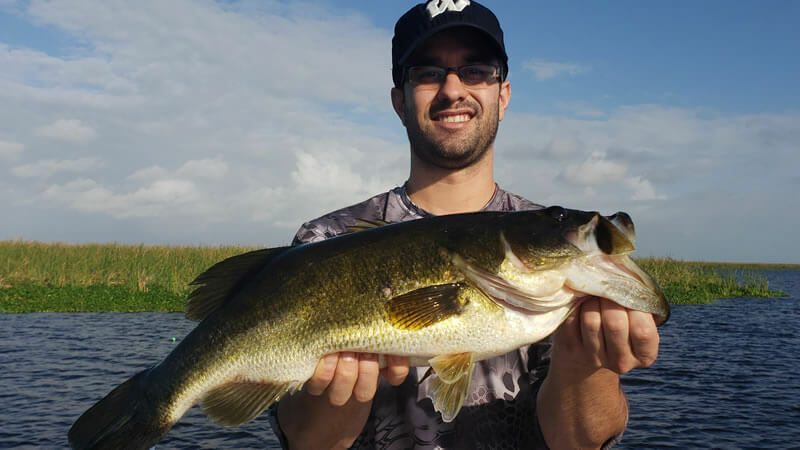 When you adventure out on Lake Okeechobee with our local experts, you can expect a great time. Your professional captains will have top of the line equipment and a clean fishing vessel for you to explore. Each destination along Lake Okeechobee is uniquely different. You never know what you will see or experience. Captain’s Brian Brown, Robert Alfano, Mark Rose, and Dave Lauer are several of our experts that can get you on the bass. Captain Brian Brown adventured out of Slims Fish Camp on a three boat fishing charter. Captain Robert Alfano and Captain Mark Rose accompanied Brian on his fishing trip. A total of 6 gentlemen explore what Lake Okeechobee had to offer. There were two anglers on each boat. 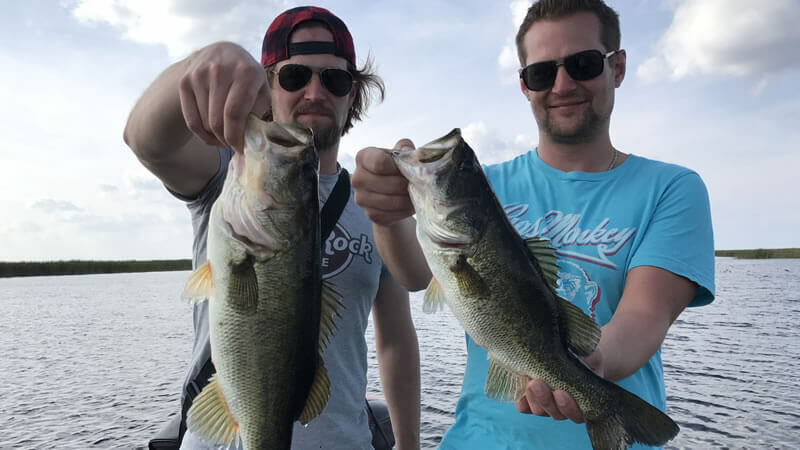 While traveling from Texas, they wanted to see what bass fishing here in Florida is all about. Football was what brought them to Florida. They travel around the states to watch different games throughout the season. It was a family fishing trip and everyone was related. Captain Brian had the pleasure of fishing with Marty and Chuck, two brothers looking to have some fun. 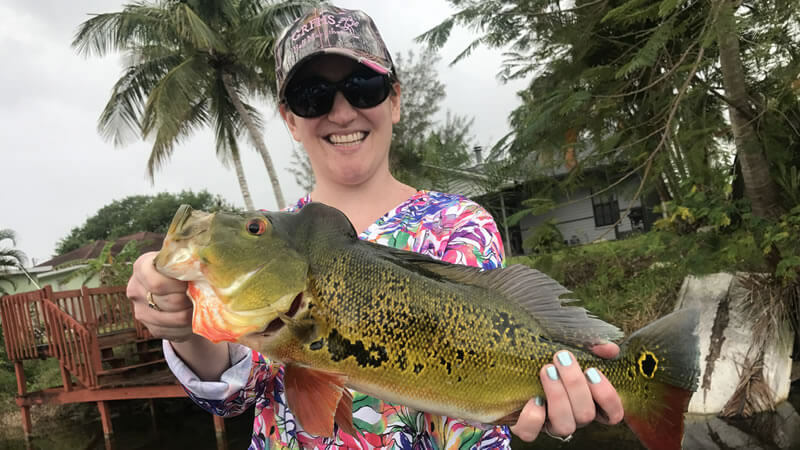 Colder weather has been rolling through Florida making for interesting fishing conditions. The morning bite has been slower as the temperatures are lower. Our captains made it happen, putting quality bass in the boat. The big females did not come out to play but several quality bass up to 4 pounds were caught. Live bait was the most successful method, especially with colder weather. Once the weather warmed up, the bass started biting! Everyone had a blast catching bass and are looking forward to coming back to Florida in the near future! Just shortly after this awesome fishing trip, Captain Dave Lauer had a great fishing charter with another wonderful family. The Buchanan Family traveled from Detroit, Michigan looking to spend some time on the water. Eric and his two sons Derrick and Connor explored what Lake Okeechobee in Belle Glade, FL had to offer. 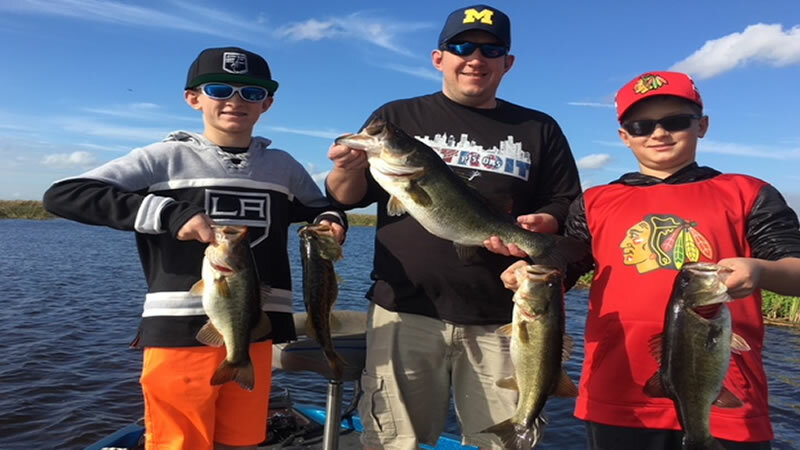 Derrick and Connor were here on a hockey tournament and had to get out on the lake to see what bass fishing in Florida was all about. The bite was much different than the last charters. The weather was warming up and the bass wanted to eat. Eric, Derrick, and Connor enjoyed using live bait catching over 25 largemouth bass. The biggest fish weighed 6 pounds with several nice fish in the 3-5 pound class. This is what you come to Lake Okeechobee for. When conditions are right, the bass feeds very strong. Unfortunately, you can’t predict or control how conditions will be. These gentlemen had a great day on the water and will never forget it. They will be back for more action in the near future and Captain Dave is looking forward to getting them back on the bass! Lake Okeechobee while traveling from Chicago, Illinois. Cold front conditions rolled back through making for an interesting day on the water. Even though the bite was slower, these gentlemen came in strong putting 12 largemouth bass in the boat. The preferred method for these conditions is wild caught live shiners. Joe topped the day off with a large female getting ready to spawn weighing in over 6 pounds. Michael and Joe will be back for more action in the near future! Captain Rob is looking forward to getting them back on the water soon. 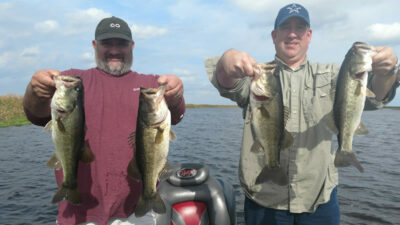 Don’t miss out on your fishing adventure Lake Okeechobee Bass Fishing. The bass fishing has been very productive. When the weather stabilizes, it will only get stronger. Bring your family out for an adventure of a lifetime right here in sunny Florida. We look forward to seeing you on the water next time!